Pork and apple have long been friends and now you can enjoy them together in one packet of ultimate salt and sweet. Our oven roast pork ‘Snackling’ has established itself as the go-to product for snacking connoisseurs that seek something a little more refined than pork scratchings. 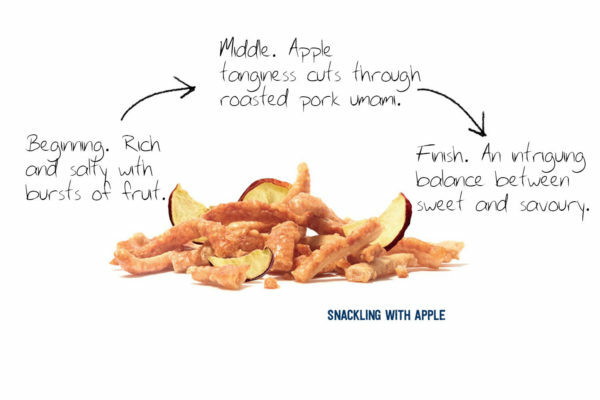 Now in a masterstroke on innovation (even if we do say so ourselves) we’ve added sweet pieces of Emily Crisps Crunchy Red Apple to accompany our crackling in the same packet to deliver the much-loved pork and apple flavour combo in snack form. George (Boss Hog) says: ”This is a snacking game changer! This exact combination of salt and sweet is totally off the chart and we’re incredibly excited. When we first tasted samples it was one of the eureka moments, we knew immediately we’d hit upon a killer product that was perfect for our customers; customers that have come to expect big flavours, innovation and top-notch quality”. We quickly discovered that the best apple crisps came from Emily Crisps so we got in touch and shared the idea which led to us developing our first collaboration product. The team at Emily Crisps were enthusiastic from the get-go and offered total support – it turned out that they were already big Serious Pig fans. It took us a while to make sure both the crackling and apple stayed crunchy for the shelf-life but we managed to find a solution and now we’re ready to launch to as many customers as humanly possible. “We love the sweetness of our Crunchy Red Apple Crisps and are delighted to see them paired with the salty goodness of Serious Pig’s Snackling, it’s going to be a big hit”. The distinctive way Snackling is cooked – oven roasted like you’d do at home, rather than deep fried like scratchings – gives it a strong point of difference. “The texture and flavour we get from oven roasting is amazing: it bubbles and turns a beautiful golden colour and becomes incredibly crispy. The flavour is rich and full of delicious porkiness. Contrast that with the sharp sweetness of the Crunchy Red Apple Crisps from Emily Crisps and you have the perfect marriage of salt and sweet” says George. The flavour journey is one well worth taking. The beginning starts with a rich and salty crunch with bursts of fruit. The apple tanginess cuts through the roasted pork umami creating an intriguing balance between sweet and savouring that leaves you salivating for more! Sound good? Head over to our shop and try it for yourselves!